I got my hands on a Ledger Nano S last week and set it up over the weekend. 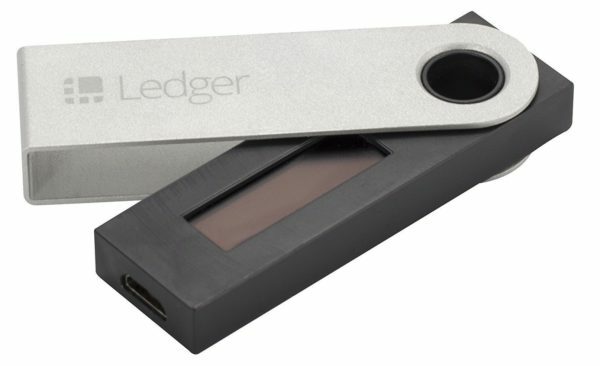 The Ledger Nano is a “Cryptocurrency Hardware Wallet” which means it is a device you can store your Bitcoin, Ethereum, and other crypto assets on. It costs $95 on Amazon. It is about the size of your average thumb drive/USB Stick. The screen you see in that photo is quite small and the UI that runs on it is pretty bare bones as a result. There are Chrome Apps that run in your browser and connect to the Ledger and provide the basic wallet functionality that you have gotten used to on Coinbase or some other hosted or software wallet (balance, send, receive, etc). I was able to set up the Ledger Nano and get it working without too much hassle. The instructions are pretty good. But the security precautions (which are absolutely necessary) are a bit of a pain to deal with and it is not the simplest experience. It doesn’t take a long time to set up, it’s just a process you have to go through. There is a USB cable that you use to connect to your computer and put the device online. You can then send and receive crypto assets and use the wallet apps to see the activity on the device. When the device is disconnected and saved somewhere safely, it is offline. Many crypto purists believe that you must own a hardware wallet and that your assets are not really yours unless you control the keys and the device on which you store your assets. For those who feel that way, the Ledger is a great solution. I personally am happy to store my crypto assets with our portfolio company Coinbase in the cloud, particularly in their vault offering which provides delayed withdrawal and multi-sig on the account. But I do understand those who feel that storing your assets on your own device is the right answer. Where I find value in the Ledger is as a solution to store crypto assets that aren’t supported by Coinbase and/or some other trusted hosted storage provider. What many people do is store their “alt-coins” on the exchanges that support those coins. That has turned out to be a dicey option as many exchanges have been hacked over the years. What I advise, and do, is to store these “alt-coins” on a hardware wallet, like the Ledger, and then move them onto an exchange to trade them, and then back off after the trade clears. The idea is to limit your assets in “hot storage” as much as possible and maximize your assets in “cold storage” as much as possible. And for that, the Ledger Nano is a great solution.